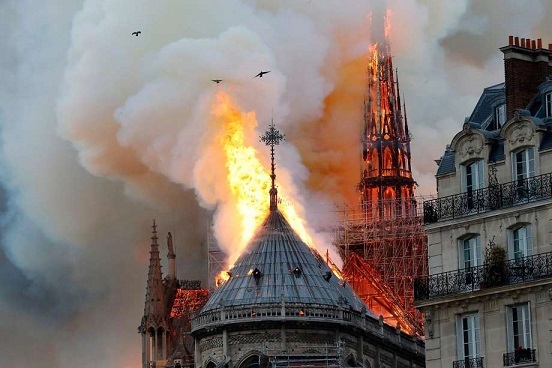 As shocked Parisians watched helplessly, fire destroyed the roof and wooden interior of the Notre Dame Cathedral, but firefighters say the structure, towers, and priceless artwork survived. Sixteen copper statues of the Apostles that normally occupy the roof peak were removed for cleaning before the fire. Paris is full of tourists ahead of Holy Week, and 30,000 tourists visit the cathedral on a typical day. A mass was being celebrated when the fire broke out, but everyone got out safely, and the only casualty was a seriously injured firefighter. Posted 15 Apr 2019 by theaveeditor in Misc.